I would love to take issue with him, but I am meeting a lot of people who are scared. As the winter draws near and it gets darker earlier, people are scurrying for their safe space. Economic fears make people feel vulnerable and without hope for the future. 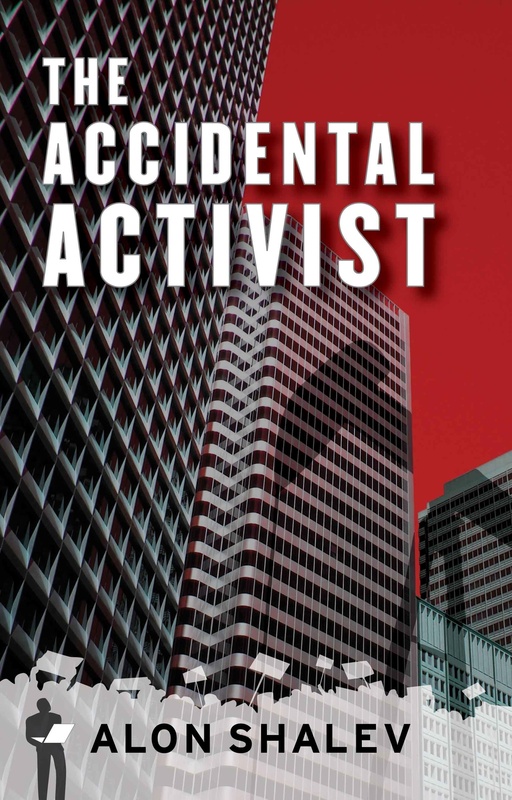 The Accidental Activist is about feeling vulnerable and disempowered. Two individuals face a huge machine that is greedy and without care. It’s about multinationals, not Wall Street, but from the same neighborhood. Perhaps the actions of my lead characters might help inspire others to reach above a feeling of helplessness. If The Accidental Activist says anything, it is that an individual can survive and make a difference, even against a rich and powerful system. So maybe this is a better time than ever to curl up with a good book. And maybe a book that highlights empowerment will help someone through this economic winter. It seems to work for this guy (or gal). If you know someone who is unemployed, feeling deflated, and would get something out of The Accidental Activist, please let me know. Between now and the end of the year I will send five books anonymously to people who need it. If you want to chip in and share the expense of the book and postage, that’s great. But I will not ask or require it of you. Our City (capital C intended) by the bay has a proud history of food justice and environmental policy. We are perhaps one of the first cities to make the connection between low academic scores and nutrition. Banning sugar-saturated soda in the school grounds or plastic bags from groceries is one thing. Taking on McDonald’s, however, now that is brave. McDonald’s have no compulsion to take on anyone and everyone, threaten them with court action and intimidate them until they back down. There is a roll call on the McLibel DVD of all the newspapers, magazines and talk shows that have crossed swords with McDonald’s. All have meekly sheathed their swords and mumbled an apology rather than go to court. Of course, there were two young people who refused to back down and embarked on what became the longest court case in British history. Click here for the factual account, and here for the fictional one. 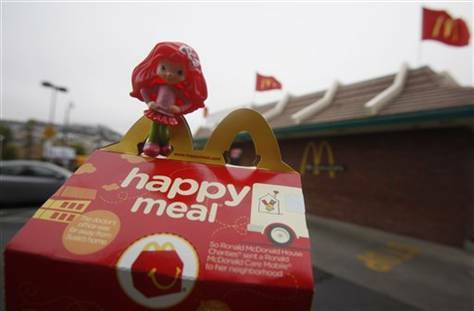 Back to San Francisco and a city ordinance has been proposed that will ban McDonald’s from offering a toy with the purchase of a Happy Meal unless there is a limitation on calories and the addition of fruit and vegetables. This proposal is, by the way, aimed at all fast food chains, but McDonald’s Happy Meals seems to have provided the impetus for the initiative. McDonald’s, naturally, aren’t impressed with a Left Coast concern for growing childhood obesity or the plummeting school grades that are becoming common around our country. When Supervisor Eric Mar proposed the law, McDonald’s Corporation sent a team of executives to City Hall to protest. The rest of us should feel grateful to McDonald’s – you can fight City Hall. McDonald’s claimed that this proposal would deny their customers the freedom to chose and is an attack on their and other businesses models of marketing. To be fair, McDonald’s are not the only business exploiting children. On the other hand, City Hall is not just going after the fast-food industry. Our Mayor, Gavin Newsom (Link) has signed an order banning sweetened sodas from vending machines on city property, broadened a ban on tobacco sales in pharmacies to include grocery stores and big-box stores that also have pharmacies. But with election season looming, the mayor has slowed his support. His opponent in the lieutenant governor’s race, Lt. Gov. Abel Maldonado, has accused him of trying to be the food police. Karen Wells, who is McDonald’s VP for Nutrition and Menu Strategy claims that it is the responsibility of the parent to decide what their child should eat. Fair point. She also claimed that it would be difficult to implement. Now you’ve lost me. “It’s different from what we’re doing today and different from what we’ve done for 25 years, successfully,” Wells said. Now you really have lost me. It is a generally accepted principle that the companies who survive and thrive for decades do so because they are able to adapt to changing consumer consciousness and demand. While a multinational corporation is governed by the bottom line, surely there must be some acknowledgment of society’s need. In fact, if we all die of obesity connected disease, who will buy the burgers? If children see McDonald’s as an amazing place to go to and eat, couldn’t McDonald’s provide an educational example, a role model, for healthy nutrition? 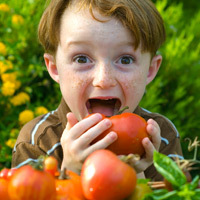 If children get used to eating fruit and vegetables at such cool places as McDonald’s, won’t it make eating fruit and vegetables at home easier? I remember proudly taking my mother around the environmental center that we had developed on my kibbutz. She was very impressed until we arrived at the composting area. Being primarily an educational center in a part of the world where ecological awareness was considered a luxury, I showed her a wide array of composting methods, with different containers and techniques. My mother grew up in England during World War 2. She is part of a generation who have the Dig for Victory psyche deeply entrenched. She has always grown vegetables and has always composted. She has never read an article or book about how to make compost, she just has. But most of us are estranged from the near mystical process of turning waste into fertile earth. Here is a great how-to video on how to start composting. It’s very cool. Enjoy. I’ve just returned from my Black Friday Shopping foray. Mrs. Blog and I rose at 4am (Friday at the time of writing) and made some new friends outside the Office Max in Oxnard. Having secured our new treasure – a laptop for the lady – I came home and saw an email sent to remind me that Saturday (today) is Small Business Saturday. In a recent post, I wrote about the challenges of the endangered species – the small, independent business. Today’s initiative is a great response to Black Friday. It is interesting that the day is being sponsored by American Express Credit Card Company – yes you read that correctly I went online to check it when I was told. Here is the Facebook page so it must be true! Though I am 300 miles away, here are a few of my favorite local businesses in Berkeley. 1. Manhattan Bagels is over on 4th Street. There isn’t a lot to say – they have the best bagels in town, a great variety (check out the Cranberry Orange), and the service and parking is smooth. 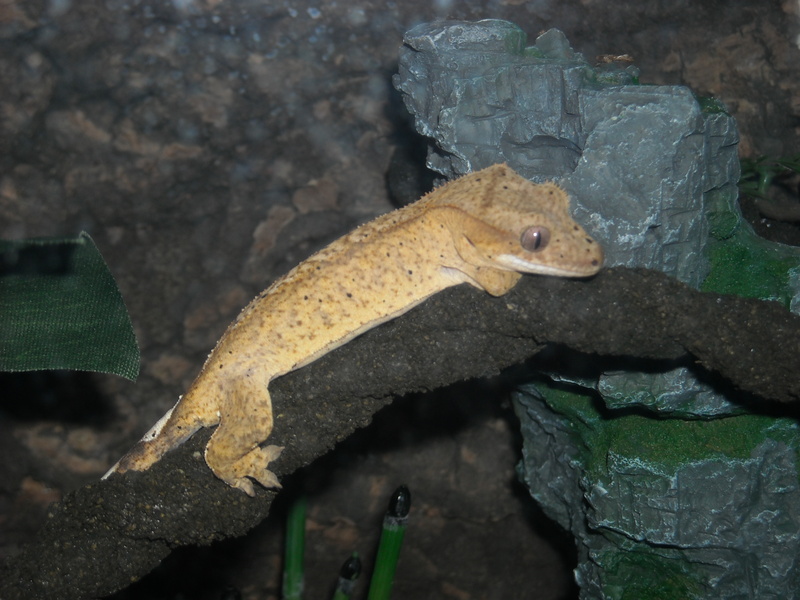 Meet the beautiful, latest addition to our family – Nanchuk, a Crested Gecko. 3. The Bread Workshop – I realize I’m pushing the carbs here, but this a great place to eat, to hang out for coffee, and to feel good with a vendor using a fair amount of local products and organic ingredients. I might be biased since they hosted the book launch of my previous incarnation of The Accidental Activist, but this really is an excellent example of a business that aims to be sustainable. 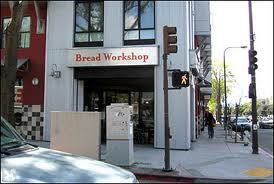 You can find The Bread Workshop at 1398 University Avenue. 4. 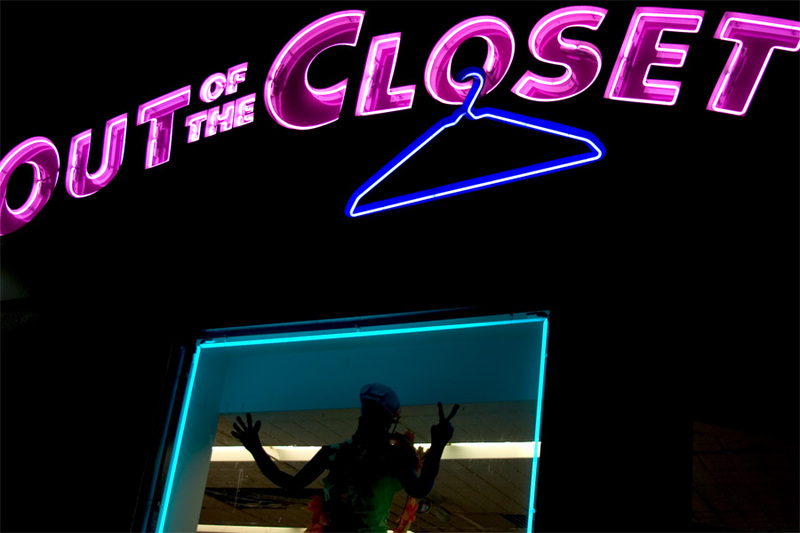 Out of the Closet – This is a thrift store (there are a few around the Bay Area) on University. The thing about this place is that there always seems to be something to surprise you and this probably explains why it is a favorite venue in the run up to Halloween. It also helps to know that Out of the Closet supports AIDS projects and was set up by one of the all-time basketball greats – Magic Johnson. 5. Rasputin Music – is an icon up on Telegraph Avenue. They have a great stock of discs at affordable prices. I’ve also picked up several movies here. So while you plan your day, here is the latest offering from my favorite musician, Lloyd Cole. I can’t think of any reason to link the song to the article, I’m just excited that he has a new disc out! And while you are here, why not list below in the comments your favorite local, small business, and give them a plug. There are a number of books about people’s personal crusade to get back to nature, whether heading out to the wilds or bringing the farm into the urban setting. 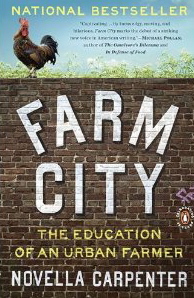 Novella Carpenter’s Farm City stands out for me because it is a stone’s throw from where I live. It’s a cool book to read. You get a flavor for the neighborhood and the people who share, often with a healthy dose of skepticism, how Novella’s project grows. This is not a how-to book, though there is a lot that can be learned of what to do and what not to do. It’s her unabashed honesty that hooks you. 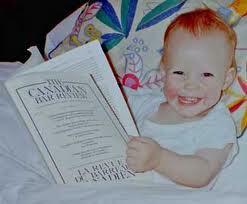 I was captivated for most of the book. It does seem that the emphasis of the book moved towards animal rearing which is not something that I, in my mostly veggie lifestyle, could relate to. 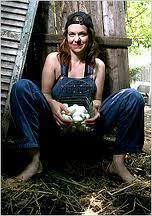 If you want to follow the progress of the little farm in the city, Ghost Town Farm is the name of Novella’s blog. Check it out. Spiral Gardens is my local community garden. It is situated at the corner of Sacramento and Oregon Streets in Southwest Berkeley, on two blocks of public land at the end of a long-vacant former railroad right of way. It was founded in 1993 and is now officially incorporated as the Spiral Gardens Community Food Security Project, an independent 501(c)(3) nonprofit organization. There are five main projects. I have taken their description straight from the website. * The Community Farm, behind the northwest corner of Oregon and Sacramento Streets, is our primary location for direct food production. At least half of the harvest goes to the low-income seniors in the adjacent housing complex, the rest is distributed among the volunteers who grow it. 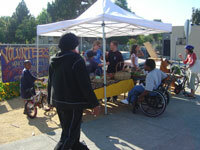 * The Produce Stand provides fresh, mostly organic produce, from local regional family farms to the neighborhood at cost. It is located on the busy southwest corner Sacramento and Oregon Streets in front of the Nursery. 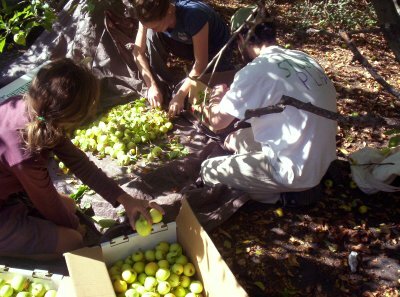 *The Community Harvest Project assists private homeowners and the community by harvesting excess fruit from backyard and community trees and distributing what would otherwise go to waste to people in need. * The Nursery, located on the southwest corner of Sacramento and Oregon Streets, makes useful plants available at affordable prices. The nursery specializes in edible plants, culinary and medicinal herbs, California native and other habitat supporting plants (particularly butterflies, bees, and hummingbirds). All proceeds go to support the project. The core volunteers are spread thin. Please check the website to see when people are invited to help out and then just drop in. People are very friendly, always willing to teach and chat. I don’t have my own garden for the first time in my life. Spiral Gardens gives me a lot more than I give back when I volunteer. And I love the fact that half the produce supports a low income seniors complex nearby. Giving back to the land, giving back to the community – what better way to spend a Saturday afternoon? Alon Shalev is the author of The Accidental Activist (now available on Kindle) and A Gardener’s Tale. He is the Executive Director of the San Francisco Hillel Foundation, a non-profit that provides spiritual and social justice opportunities to Jewish students in the Bay Area. More on Alon Shalev at www.alonshalev.com. 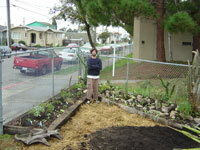 Community Gardens – Greening the Revolution One Neighborhood At A Time. I am a child of the generation who fought World War Two. England was a country hemmed in by Hitler’s armies with only 20 miles of water between them. The British entered a siege mentality. 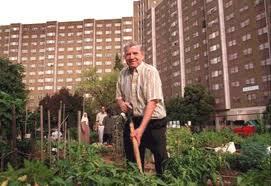 In the cities, they took empty plots of land and began growing vegetables. Dig for Victory was the mantra. Thirty years on, when I grew up in London, these parcels of lands – allotments – commanded a waiting list of people still trapped in that siege mentality. The ability to grow your own crops was a reassuring subconscious feeling of freedom. Fast-forward to today and we are seeing another agricultural grassroots consciousness. 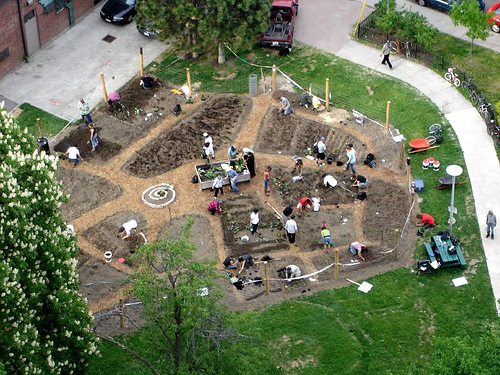 Community gardens are springing up all over the place. Here in the Bay Area, they are particularly prolific. But the motivation is different. Today people seem to derive great satisfaction leaving their screen -dominated worlds for an afternoon to get dirt under their finger nails, want to make a connection with their food source, and are relieved to bear witness to a pure (organic) form of growth for the nourishment they will put into their mouths. It doesn’t matter if you have no knowledge. There will be others ready to show you. Some go to the gardens to work, others to buy their produce. And above all, it helps create an organic (pun intended) community. Perhaps there is a historic psyche, remembering the closeness of human bonds in our agrarian pasts. 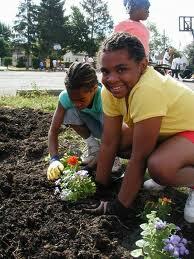 For an oversight of community gardens, please visit the American Community Garden Association. 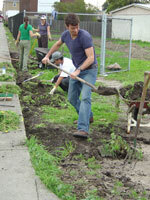 (http://www.communitygarden.org/). They have a page for how begin a garden. Following on from the post about McLibel DVD, I want to focus a few blog posts on the need for food justice. It just seems that if we could be more accountable for what we put in our mouths, we could significantly change the world: economically, environmentally, with regard to health, and perhaps even the way we treat ourselves and otherl. We all live downstream. Here’s a great take on food justice from the superb Dana Lyons. I just arrived home from my wonderful dentist, Dr Arnold (fondly known as one half of Dr. Happy Tooth). At the clinic everyone was talking about Thanksgiving and in particular about food. Thanksgiving is a hard time for the lonely and the hungry. The San Francisco Food Bank is in one of its busiest time of the year. Turning on my computer I received an announcement that from now until midnight on the 25th, Visa will match every gift up to $25,000. In other words, when we donate, our gift will go twice as far. Click here for donation form. Please consider helping. In Judaism, the number 18 corresponds with the word chai, meaning life. When you give $18, Visa will ensure that it is a double-chai, offering twice as much food and comfort at this special time of the year. When the SF Hillel staff and students volunteered recently, we met a truck driver who is now working for the food bank. His story is similar to Assistant warehouse manager Al White, who is the backbone of the Food Bank’s warehouse operations. In his twelve years at the Food Bank, Al has rarely missed a day of work — and his dedication means that the Food bank to send 88,000 meals out the door every day. There are many people in difficult circumstances, who for one reason or another, are out of a job, but want to work hard. I know because I used to be there. But I was given a chance. Several years ago, after a bout of bad luck, I was on General Assistance, the City’s cash aid program. To qualify for this program, though, I had to work, so I volunteered at the San Francisco Food Bank. It was a good choice. I was treated with respect and realized I could make a place for myself while making a difference. My first job was to mop the floors. But I had worked as a carpenter for 25 years, so I knew how to work hard. I was soon hired on as a driver and then worked my way up to the receiving coordinator. Now, twelve years later, I’m the assistant warehouse manager. Please, take a moment to help match Visa’s generosity and pass this link on to everyone you are comfortable with sharing the opportunity. In an earlier post I discussed the trial itself. I want to take the opportunity to promote the documentary which shows many behind-the-scenes exchanges. The story of McLibel is also the story of the Internet evolving into a tool for social advocacy, something that a decade later we activists now take for granted. In The Accidental Activist, I focus on this aspect by making my protagonist the computer programmer who sets up the Oilspill website. I remember meeting the real person in the early ’90’s just after he had put up McSpotlight.org and enjoying his unbridled enthusiasm for what was unfolding.